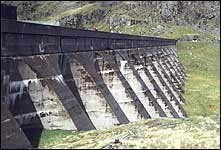 A dam is a man made barrier usually built across a river to hold back water and forming a lake, or reservoir, behind it. It can be constructed from concrete or natural materials like earth and rock. Arch dams are made from concrete. They are curved in the shape of an arch, with the top of the arch pointing back into the water. An arch is a strong shape for resisting the pushing force of the water behind the dam. Arch dams are usually constructed in narrow, steep sided valleys. They need good rock for their foundations, and for the sides of the valleys, to resist the forces on the dam. 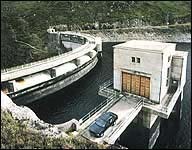 There are only a few arch dams in the UK, including Monar Dam in Scotland. Buttress dams are made from concrete or masonry. They have a watertight upstream side supported by triangular shaped walls, called buttresses. The buttresses are spaced at intervals on the downstream side. They resist the force of the reservoir water trying to push the dam over. The buttress dam was developed from the idea of the gravity dam, except that it uses a lot less material due to the clear spaces between the buttresses. Like gravity dams, they are suited to both narrow and wide valleys, and they must be constructed on sound rock. 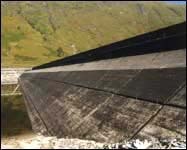 Since 1945, 14 buttress dams have been constructed in the UK, mainly for hydroelectric schemes in Scotland. Embankment dams are made mainly from natural materials. The two main types are earthfill dams and rockfill dams. Earthfill dams are made up mostly from compacted earth, while rockfill dams are made up mainly from dumped and compacted rockfill. The materials are usually excavated or quarried from nearby sites, preferably within the reservoir basin. A cross-section (or slice) through an embankment dam shows that it is shaped like a bank, or hill. 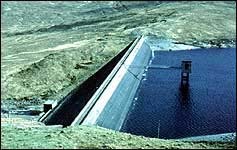 Most embankment dams have a central section, called the core, made from an impermeable material to stop water passing through the dam. Clayey soils, concrete or asphaltic concrete can be used for the core. Rockfill dams are permeable. They can have a core or an impermeable cover on the upstream face. Materials used for the cover include reinforced concrete and asphaltic concrete. Embankment dams are usually chosen for sites with wide valleys. They can be built on hard rock or softer soils, as they do not exert too much pressure on their foundations. 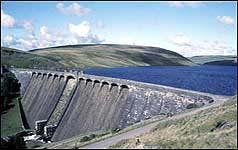 The main type of dam in Britain is the embankment dam, and there are over 3000 of them. 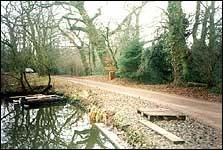 Some of them date back to the 9th Century, including Fishers Pond Dam, near Winchester, which was built by monks to provide fish. The average age of our embankment dams is over 100 years old. A gravity dam is made from concrete or masonry, or sometimes both. It is called a gravity dam because gravity holds it down to the ground stopping the water in the reservoir pushing it over. 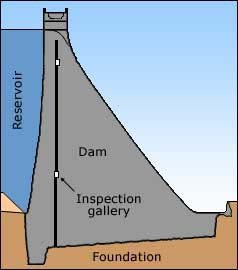 A cross-section (or slice) through a gravity dam will usually look roughly triangular. Gravity dams are suited to sites with either wide or narrow valleys, but they do need to be built on sound rock. 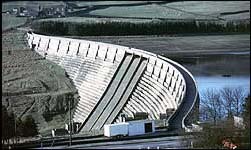 There are more than 250 gravity dams in Britain. Masonry was used in many early dams, as far back as the 17th Century. However, concrete became more common from about 1900.